Branching and merging while using a source control system such as Subversion can sometimes catch people out, so here is a quick and dirty guide to cover the basics. For this example I am using Visual Studio 2010, TortoiseSVN 1.6.6, Subversion 1.6.6 and AnkhSVN 2.1.7819.411, so if you are using different versions, some of these screen shots may differ. This is assuming you have your code checked in to the trunk directory and have a standard SVN structure of trunk, branches and tags. There are a number of developers who prefer to develop solely in a branch and never touch the trunk, but the process is generally the same and you may be on a small team and prefer to work in the trunk and branch occasionally. There are three steps to successful branching. First you branch, then when you are ready you need to reintegrate any changes that other developers may have made to the trunk in to your branch. Then finally when your branch and the trunk are in sync, you merge it back in to the trunk. For this example I copied the project to another location prior to branching and made changes to that using Notepad++. 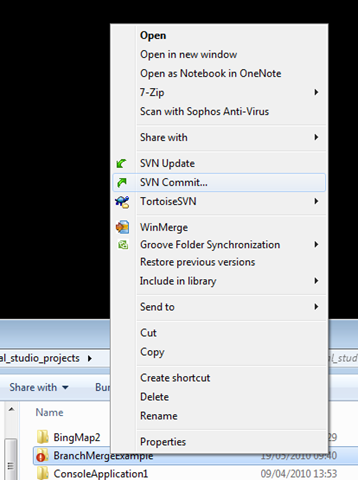 Then committed it to SVN, as this directory is mapped to the trunk, that is what gets updated. This will open up TortoiseMerge which will allow us to resolve the issue. In this case I want both changes. Reloading in Visual Studio shows we have all changes that have been made to both trunk and branch. Open project in Visual Studio, we now have all changes. So there we have it we are connected back to the trunk and have all the updates merged.